We had a wonderful Christmas and I hope the same is true for all. What a year this has been. It seems that every year flies by faster than the last. However this year I feel I have been a bit behind all year. In the coming year I hope to become a bit more organized, and do a few projects around my home that are desperately needed. I tend to get these great creative inspirations going and fail to follow through on tasks around my house. I intend to go through each room this year and sort organize and redo. Something about my mid forties has made me want to declutter.I guess I'd better start with taking down my Christmas decor.Have a wonderful week and blessed New Year! One of my Favorite family traditions is spending a day with each of my kids. We call it their "Special day" Each child picks how we spend their day and where we go, what we eat,what we do, whether it be shopping for others, doing an activity, going out of town etc. I look forward so much to this, it is a chance to spend time alone with each kid and have fun one on one. Today was my 17 year old son Aarons day. We went all over and had a great time shopping for siblings and checking out a few knew places. Here are a few more Christmas pictures including some wreaths that I made. Just a few additional pictures of my mica village and brush tree collection. I wont show pictures of our tree as it is decorated completely by our kids,who each have their own ornament collections and it may not be picture perfect but boy is it covered with sweetness! I Truly love this time of year!! I love our home all decorated, I love to bake, I love the coziness that the holidays bring. It even smells good to me. If it were up to me I would celebrate for three months instead of one. I constantly have to remind myself why we celebrate this season, that it goes far beyond the decorations and family gatherings and all the fun activities. For it truly is such an incredible event that we celebrate. The birth of our savior Jesus Christ. If only our shop crazy culture could slow down just for a time to realize just what it is we celebrate this time of year. There are no amount of gifts, food or activities that can give us the peace and fulfillment that we can know in this incredible gift our Savior. Today was the first day of the Monticello's Christmas Sale. 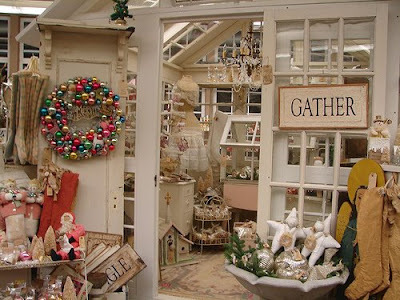 It was Magical and filled with lovely vintage Christmas items. The store was packed with people and it was fun to watch what items they filled their baskets with. Everyone has their own personal taste when it comes to Christmas decor and that makes it so much fun.We helped in the morning and then headed home to finally relax after days of preparing, setting up and driving. Tomorrow we spend some quality family time and decorate our home. Yeah!!!! My gift is not blogging I have decided. I seem to never remember to take pictures and the computer is often not on my list of to dos. I spent yesterday and today frantically setting up my area at the Monticello in Portland. I tried so hard to finish the job in one day but that didn'y happen. So after jostling my schedule and kids around I finally finished and got home around 9:00 tonight. Yeah! !, its done at least as done as it is going to get. If you have not been up to the Monticellos Christmas openhouse, it is a must. The venders are outstanding and the featured Christmas area in the back is looking fabulous. There are some really talented people out there. My sister-in-law Deb has done a wonderful job along with many others. Its hard not to want to shop instead of setting up. I stayed on task ,knowing today was my last chance. Here are a few photos I manag ed to take before closin g time. We spent weeks gearing up for our ninth annual "Christmas Memories" show. We weren't sure how it would go with all the talk of a sad state of economy. We were happily surprised to have a wonderful flood of people and a fabulous sale. We try really hard to provide a fun and charming atmosphere with lots of nostalgia and a sense of true Christmas warmth. We incorporate all the kids we know as well as friends that are dear enough to help us. We also serve a yummy cafe that is a fund raiser for the youth in our church, the food was wonderful. (especially the cinnamon rolls) Thanks Terry!! This year our 14 year old Gracie even served a full espressos bar. Me being the not overly organized type, failed to take any pictures what so ever. My friend Krissy a photographer, came through for me though and sent me a few pictures she managed to get. Over all the weekend was a huge success and now we just deal with the after scene. A huge load was stuffed into our spot at the Monticello and now we will continue preparing for the Wonderful Christmas open house that takes place there on the 5&6 of December where we will set up a special area in th e back. Coffee and Crafting...Two of my favorite things! we've had lots of company which has been a pleasure, but now its time to get serious, thank goodness I seem to to do well under pressure. Each year I plan to start the Christmas crafting during the summer and of course that never happens. Somehow it has to rain abit to get me in the mood. Anyway I'm loving being in my cottage , dreaming up ideas and spending any spare time sewing and creating. Here are a few of the things Ive been up to. We Are all frantically preparing for the Christmas season. When you do this full time, even the youngins get involved at crunch time. Here is Emma preparing garland from my wool scraps. We are gearing up for our biggest sale of the year. We put this show on here in Eugene and it is a great show, highly attended and has been hugely successful. If you are a vender and you are interested in selling either antiques or handcrafted with a vintage flair. Please let me know and I'll send you out the info.The date of this show is November 7&8. Have a great week!! Marv and I left early and headed for the Monticello in Portland to completely redo our booth and get it ready for the fall sale. Midway through I wasn't sure I would be done by closing but low and behold it all came together in the end and I felt pretty good about how much I got crammed in. What great people we have had the privilege of meeting through the Monticello. Today we saw,Lisa and Issabelle, Joe and Sue and Sister in law Debbie and Jon. This weekend was The Coburg antique show. It is a huge event and we take it quite seriously as it is usually a really great show for us. This year we were not disappointed. The weather was excellent and my great friend Sue, braved the middle of the night setup, and came along to help.Sue arrived promptly at 3:15 a.m. and off we went to setup.h 11 year old Emma in tow, who insisted on helping this year. The weather was agreeable and we had an excellent show. We had a constant flow of people and we were so glad to have extra help. Thanks Sue!! Today we spent the day preparing loads of fun stuff for our Coburg sale. We are at the point of trying to remember whats on our list to remember? Anyway we are at the crazy stage before a big sale, when our kids run the other direction,thinking they will have to tie on tags, tea dye something or print out tags on the computer. All things that I run short of time with and beg their help. Actually I think they secretly like the stressful stage when I start bartering with them or as some call it bribing. This morning we woke up to a very sad Sunday. Our new lab puppy somehow got into our bunny hutch that houses our nine year old's sweet bunny and managed to eat it. Our kids were beyond consolation.It was horrible! All I could think of was to try and find another bunny that could somehow replace "Tubby". I frantically looked on craigs list and everywhere possible on a Sunday morning. I finally spotted one that was the same type and looked adorable up in Salem. Bingo! Little son, Caden liked it and so I called the gal and asked if we could come up and pick it up today. She was kind enough to let us come and since there were two bunnies we decided to be sure we had a winner and took both. Off to church we went and then hurried up to Salem. We were thrilled to find very nice owners who sent us off with a larger hutch also. Thanks Lori and Pat!! We got home to a very happy little boy whos tears turned to smiles. What a day! This weekend we celebrated the Birthdays of our daughter turning 22 and our son turning 17. Wow , way to make a mom feel old. It was a fun time with friends relatives and lots of food. My husband barbecued and I added a few other side dishes. We went with a castle cake with knights to represent son Aaron, and a fair maiden to represent daughter Julie. What great kids they are!! G randbaby Maya arrived promptly at a little before 7:00am as usual so her Mommy can speed off to work. So as not to bore her, grandpa and I took her out for a little early morning garage sailing. (Hoping to train her early). We found some fun sales out in the country.We have found that driving out aways works better with our little gal as she is not always in the mood for a crowd. Well we found some great sales, once again I failed to get good shots of the furniture pcs. but got some pictures of smalls. We are seriously stocking up for Coburg. I can't wait to sell some of the piles that are gathering around our house and shop. The little cowgirl outfit is from the 40's and has the origional pattern with it. I had my little gal try it on for fun. This was such a fun surprise! We went to the Monticello to bring up some treasures and fluff our booth and Lisa from "A THING FOR ROSES" had dropped off the special wall paper assortment that I had won from her blog give-a-way. I have a fairly short memory and was thrilled when the gal at the desk showed me the package. I had no idea what a sweet give-a-way or I would have entered several times! ha! The package not only had beautiful sheets of wallpaper, but also several other tiny treasures. All that to say THANKYOU SO MUCH!!! Lisa, I love love love everything. You are so sweet! Marv and I Started out early this morning in hopes of finding some fun sales. We decided to head out in the country to a sale that sounded interesting. I knew we were taking a chance as one can never tell by the ad in the paper. We were not disappointed. This time we ended up at the most incredible sale and there was only one other person there. We had our grand baby in arms along, so I had hoped for a non pushy type of sale, yeah!! 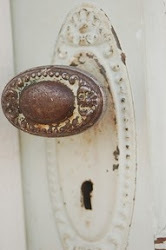 We found lots and lots of great old furniture along with some fun unusual smaller items as well. We Loaded up our loot and I forgot to take pictures, Marv covered and tied our treasures in the back of the truck so maybe I'll get some photos when unloading tomorrow. We did take an after shot of the furniture I left behind. Here are some of the smalls I got. Most of the load will go to Coburg for the Coburg antique show. This is a fabulous show if you haven't been there.